love | Who Said Life Wasn't Complicated? On Saturday, I attended the youthwork summit in Manchester: An incredible thought provoking, God soaked, challenging and inspiring day. Over the next few days, I hope to explore what I thought worked well (as well as what didn’t), what inspired and challenged me, what I disagreed with and what, frankly, bored me. sadly I couldn’t make the retreat or the other activities on the Friday so my posts will focus solely on the Saturday event. After a lunch hour that consisted of mostly wandering around aimlessly trying to find somewhere we could buy a sandwich, finding said shop, buying a sandwich (and eating it…obviously) we took our seats for what I hoped would be an inspiring and challenging set of talks. First up was Steve Griffiths who wanted to bring back “hit and run youth ministry”. Griffiths spoke of his frustration with how people used the term ‘incarnational’. He believes that most people who use this term do not use it correctly and do not base their work on the style of Christ. He said that hanging out with young people so that we earn the right to speak to them is a load of rubbish and we need to get back to how Jesus operated. I agree with his frustrations, but for different reasons. Youth work is so much more than hanging around with young people. It is this kind of thinking that shames our work and makes us look like a bunch of people who have nothing better to do and have no aims or objectives. Secondly, I hate this kind of manipulative agenda that we sometimes carry as Christians. The idea that we befriend and get to know people so that we can build a bridge that allows us to share the gospel with them. Jesus didn’t do that and neither should we. He helped people, met their needs, talked with them, stood up for them, fought for them. I don’t start friendships with people so that I can change them in some way. that’s not authentic. That’s what salespeople do and that’s not what we are. After outlining his frustrations he went on to talk about two greek understandings of time that were used in the New Testament. 1) Chronos– Time that can be measured.. quantitative in assessment. seconds, minutes, hours, days etc. 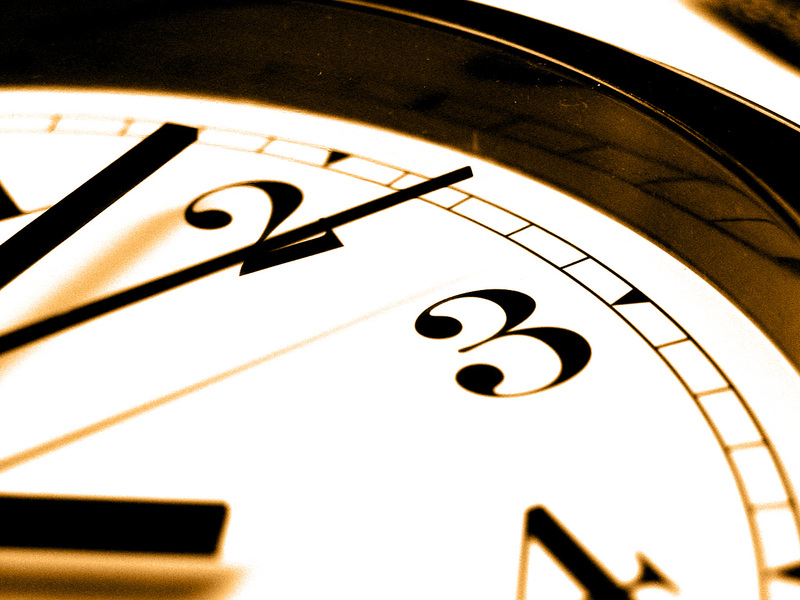 2)Kairos– time that is qualitative in assessment. It’s about how you feel. “That hour felt like two”. It is time that is measured in eternity. Griffiths shared how he felt that youth workers focused on chronos time on Kairos. He spoke of how we think we need to spend loads of time with young people but that results in us feeling guilty because we don’t think we spend enough time with young people. Thinking about it, that might also be connected with how we feel about the times we spend praying, reading the bible etc (but that’s another post). Griffiths urged us to move away from Chronos and focus on Kairos time. We need to be people who live in Kairos time to help young people encounter eternity through our conversations. This all sounds good and throwing in some greek words makes you think that what you’re hearing is right but I think this approach is fundamentally flawed. H said that we feel guilty about how much time we spend with young people. Is it ever enough? But that wouldn’t change with focusing on kairos time. we would still feel guilty but it would be a different type of guilt. we would feel guilty about whether or not our conversations were meaningful or not. it won’t change anything. What we should be is intentional. Intentional about our work and intentional in our relationships. We should be ready to have those conversations with young people at any point if they ask. not just when we feel we’ve spent enough time with them. And anyway, can you have kairos time without chronos time? surely they go hand in hand. Up next were lucy bannister & sid williams talked on “sharing your life with young people”. The exact opposite of what Steve Griffiths was suggesting. Brilliant stuff. They shared personal stories about how getting to know young people and being ‘present’ in their lives was a better way of understanding incarnational youth ministry. It is about being there for young people without having an agenda. It’s about sharing in their story and, at times, if appropriate, demonstrating how they are part of God’s big story. I enjoyed what they had to say but the one thing I found unhelpful was when they said, “love first then professionalism.” (or something to that extent). In the context of their talk I understood what they meant but I think that kind of quote can be taken the wrong way and can lead to all sorts of trouble. We should be professional in our youth work. We should take it seriously. We should have polices and procedures in place to make sure people are protected. 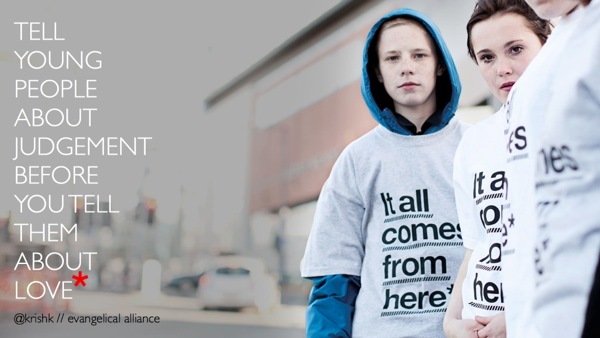 If we don’t, out work can be become sloppy and we leave vulnerable young people open to risk. I’ve not always agreed with Kandiah’s views on certain theological issues But I listened to his talk with an open mind and was surprised that I agreed almost entirely with it. Kandiahs main point was that when Jesus spoke about judgement it was to those who were the “in” crowd (ie the religious crowd who believed that they were safe). To everyone who was in the “out” crowd, he spoke love. His point was that the context you find yourself in will determine the message you bring. To some you may need to preach judgement whilst to others you will need to preach love. As an introduction to the subject, I thought this was clear and concise and Krish came across humble and honest. It does leave me with some questions however. 1) Using the gospel of Luke to make his point is fair enough because Luke talks a great deal about insiders and outsiders but what of the other gospels? Do they make the same point or would they offer an alternative view? 2) What do you actually mean by ‘judgement’? I would suggest that this will be where Krish and I disagree. I realise there wasn’t time to go into that and ir wasn’t the place to do so but it’s an important question. In my next post I’ll speak about the remaining talks in the “deepening faith” stream. Thoughts/ comments? do you have similar comments or would you completely disagree with what I have said? I try not to pull other christians down. Especially online. I don’t think its helpful.I don’t think it’s “christian”. So, this post is not about attacking mark driscoll. There are enough places you can go online if you want to do that. What I do want to attack his understanding of the notion of love. Or at least offer an alternative view. The video above is from a sermon he gave on Sunday morning. Let me first say that I agree with some of the concepts he is saying. He is right that we often cherry pick attributes of God, the ones we like, and drop the ones we don’t agree with. I know that God is loving and God is just. That’s not where I think Driscoll has messed up. It’s his understanding of the following verse that, i believe, is incorrect. I do not think, in this verse, John is saying “god is loving”. John is not telling us about one of Gods attributes. He is stating something more profound. he is saying that God is love. The essence of God…is love. At God’s very core; God’s DNA is love. So every attribute of God whether it be justice, mercy, wrath etc comes out of a place of love. Love is the lens for every attribute of God. Love is the lens that every decision comes from. That’s why I am deeply concerned with what Driscoll is portraying here. He is painting an image of a God that does not have love at its core. And i think that leads to all sorts of trouble. Thanks to Zack Hunt for the heads up on this. Check out his blog for other inconsistencies in Driscolls’ talk. I guess there are a number of ways you can ask the same question. 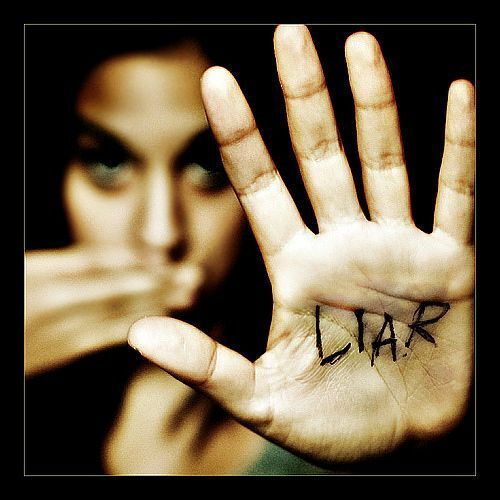 Is it ever right to lie? 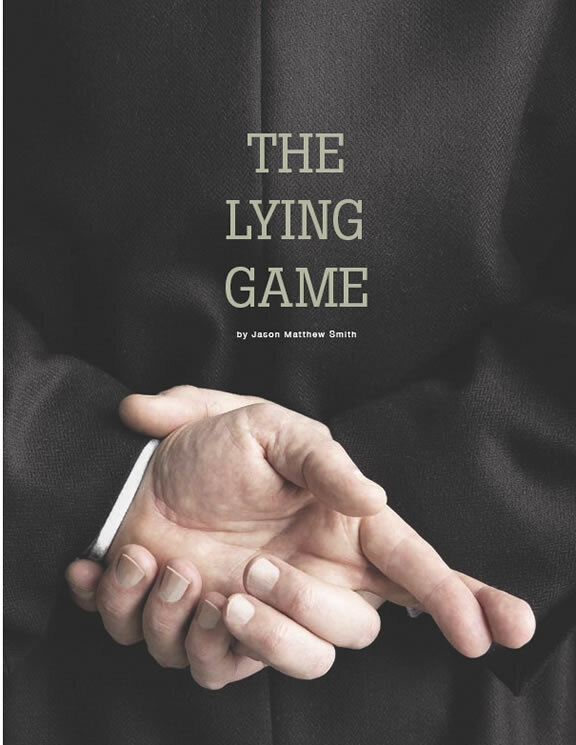 Is lying always wrong? Are there situations or circumstances where lying, although not necessarily encouraged or commended, is acceptable? But it all comes back to the same thing. How do you answer that question? How do your young people answer that question? Let me tell you what some of the young people I work with thought and we will take it from there. At our youth house group (15-18 year old) we were playing ‘question jenga’ (I’ll blog about that at some point) and one of the young people got the question, ‘is lying ok?’ and they answered, “in certain circumstances”. This answer started a short discussion on the subject, where young people threw different answers and bible verses around. In the end the majority agreed that lying isn’t good but in certain circumstances it is permissible. Do you agree? To be honest, before I started looking into things, that’s the view I held. But as someone who values good theological discussion, that answer really didn’t cut it. So, what follows is a brief look at lying and the bible. Deontological– Law. A Rule is a rule and you don’t break it. For example, the commandment ‘Do not murder‘ would mean just that. You never murder. Under any circumstance. Check out Kant‘s categorical imperative if you’re interested in it further. Teleological– The simple way of understanding this would be, ‘the end justifies the means’. The commandment, “Do not murder’ would be a little more loose in this view. In general, it is right not to murder but if by murdering someone, it would save the life of many more, then it would be right to break that rule. I hold the teleological view in most cases. Not all. But in most. With that little preface out of the way, let’s explore a few verses that are often used when discussing what the bible has to say about lying. The 9th commandment is frequently quoted around this subject but the fact is, it’s a very specific aspect of lying that God commands us not to do. The words used are words that would be said in a court. Don’t lie about what someone has said or done. This verse is not against all forms of lying. It is not saying, do not lie to ‘your neighbour’. It is saying you should not lie against or about ‘your neighbour’.There is a big difference between the words to and against. That aside, there are verses that are much clearer on this issue. Here are just two that I have picked. Both, appear, to condemn lying in a more general view. So quoting those two verses (and there are many more) it is clear then that the bible commands us not to lie. Well…yes and no. In Exodus, Pharaoh commands that all the newborn Jewish boys should be killed. But the midwives disobey this and let them live. When Pharaoh asks them why they are allowing them to live they reply, the Hebrew women … are vigorous and give birth before the midwife comes to them” (Exodus 1:19). They lied to Pharaoh. The passage goes on to say that “God was kind to the midwives and the people increased and became even more numerous.” God blesses the women for what they have done. Lying. A similar idea is found in Joshua 2 when two men are sent out to spy on Jericho. The king finds out and the two men hide in the house of Rahab. The king’s messengers come to the door and asked Rahab if she has seen them. She replies, “The men came to me, but I did not know where they came from. And when it was time to close the gate at dark, the men went out. Where the men went I do not know. Pursue them quickly, for you can overtake them” (Joshua 2:4–5). The story goes to on to say that she is spared when the Israelites attack Jericho because she lied to the king about the whereabouts of the men. Her lying is commended. So, in certain circumstances, it is permissible to lie. I use the term permissible rather than justifiable as I do not think the bible should be used to justify any action. We are back to the conclusion the young people at the house group came up with. But is that enough? And in what situations is it permissible to lie? Let’s look at that briefly. Every other commandment is superseded by these two. Ever other commandment must be seen through the lens of these two commandments. We cannot talk about whether murder, lying or any other thing is right or wrong until we have discussed the first two. So, I believe in situations where these two commandments are being broken, then lying may be permissible. I’m reminded of the stories of the people who hid the Jews from the Nazis and when they came searching for Jews, told them that they weren’t hiding any. These people lied but only because the Nazis were not ‘loving their neighbour’. What this reveals to me is that there cannot be a hard and fast rule about lying. Rather than simply creating a rule for our young people, we have to help guide their values. We should remind them of the words of Jesus and how that should impact all our actions, not just lying. That time of year again where I look back at all that cinema has given me over the last 12 months. This year, unfortunately, it was easier to pick crap films than good ones. Spiderman 3 and Right at your Door hold the joint titles of WORST FILM OF THE YEAR! Why did you do it to me Spiderman? Why? !I generally rate films on if they inspire me to make more films so my top 10 might be very different from yours. 1. The Bourne Ultimatum 2. The Nines3. Superbad 4. Planet Terror5. Atonement 6. Death Proof (first half. second half was really boring)7. Casino Royale8. Transformers9. 28 Weeks Later10. Jesus Camp What u think? The films that didn’t quite meet the top 10 areThe Fountain, Smokin’ Aces, 300, Hot Fuzz, Zodiac, 30 Days of Night, Stranger than Fiction, Notes on a Scandal, Knocked Up and Venus. All great films in themselves.